The Georgetown University Center on Education and the Workforce (cew.georgetown.edu) tracks the return on investment (ROI) of college and specific college degrees. Though going to college is better than not, assuming the individual graduates on time and from a good school, what you study also affects earnings. 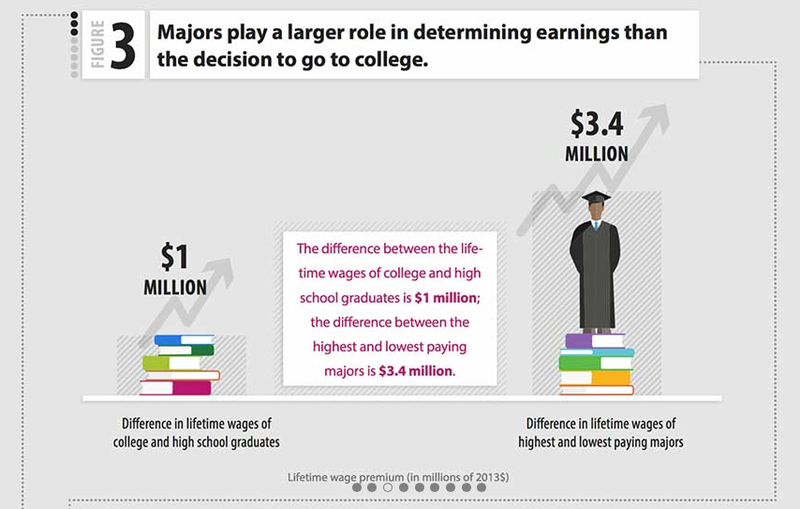 Obtaining a four-year degree is worth about $1 million over a lifetime compared to not earning a college degree. Obtaining a degree from one of the 20 most elite universities is several times more valuable than earning a degree from a non-elite undergraduate university. 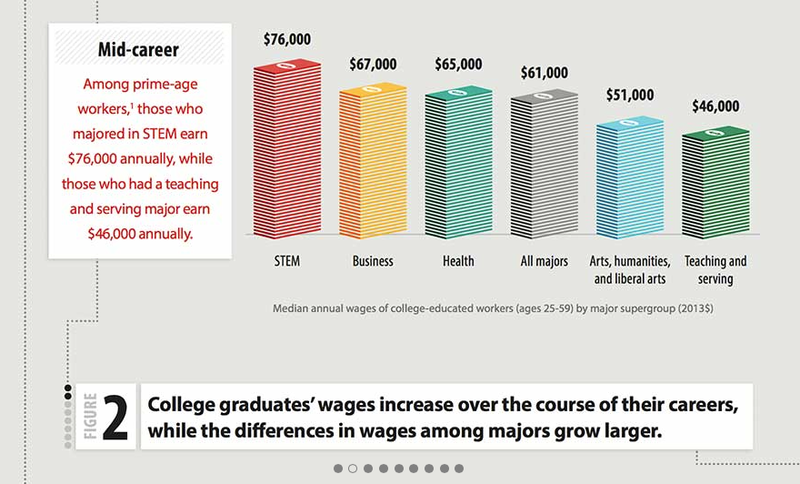 Obtaining a science, technology, engineering, or math degree from any respected school is better than a liberal arts degree, by an average of $3.4 million in lifetime earnings! Obtaining a liberal arts degree from a low-ranked school is similar to not having attended a college! The following charts are from the CEW 2015 report, based on 2014 data. 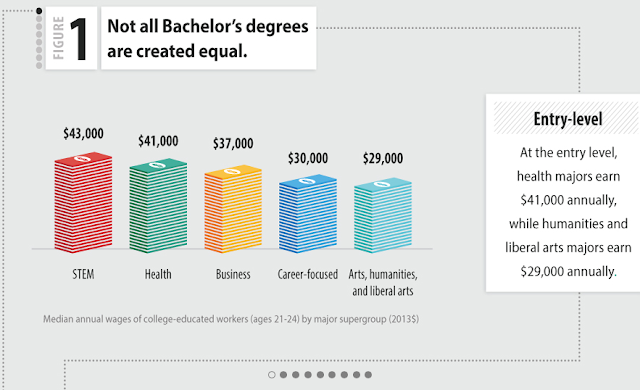 Since the median (half above, half below) household income for 2014 was $52,250, two married liberal arts graduates from a university would likely earn slightly more than the national median as a household. Two STEM graduates marrying would begin their professional lives more than 50 percent above the median! 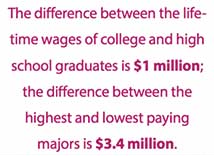 Individually STEM, business, and healthcare graduates out-earn the national median household income by mid-career. The following chart illustrates the gap between degrees and earnings in mid-career. Because studies in the United States and Europe suggest that "like marries like," we find that wealth increasingly concentrates with couples in the STEM and business fields. Two teachers marrying versus two technology experts marrying? That's a significant gap between those households of $60,000… a gap greater than the median household income. People with similar education tend to work in similar places and often find each other attractive. On top of this, the economic incentive to marry your peers has increased. A woman with a graduate degree whose husband dropped out of high school in 1960 could still enjoy household income 40% above the national average; by 2005, such a couple would earn 8% below it. In 1960 a household composed of two people with graduate degrees earned 76% above the average; by 2005, they earned 119% more. Women have far more choices than before, and that is one reason why inequality will be hard to reverse. The lifetime earnings gap is enormous for one person. It's massive for two highly educated people in the STEM fields. For a technical household that's a $6.8 million lifetime earning advantage if both partners have STEM, business, or healthcare degrees. That's a lot of money, all based on what people choose to study. In 2012, Bloomberg found that STEM degrees, and schools offering STEM degrees, offered a better ROI than other universities. This trend has held for the last three years. Nearly a third of the top 30 schools were engineering schools, including the top three institutions: No. 1 Harvey Mudd College, No. 2 California Institute of Technology, and No. 3 Massachusetts Institute of Technology. All three schools had 30-year ROI well above $1 million, a claim only 11 schools could make. On average, engineering schools had ROIs of $603,362, more than double the ROI for liberal arts schools ($245,943), more than triple that of business schools ($141,014), and more than 26 times that of arts and design schools ($22,328). The only schools that fared better than engineering schools were those in the Ivy League. Seven of the eight Ivies are in the top 15, and the average ROI for all eight was more than $1 million. While costs for these schools are high, several factors worked in their favor, including generous financial aid and excellent graduation rates—both in terms of how many students ultimately graduate and how long it takes them to do so. The weighted net cost to graduate was $84,241—less expensive than half the schools on the list, and half the cost of the most expensive. A final thought. Duke University has identified schools that seem to correlate with lifetime earnings, as well. Averages are notoriously bad statistics (median being a better measure), but higher median earnings do align with higher average earnings.